Here at Rising Signs we have a Canon Oce (oh-say) Arizona 350 GT Printer. This UV-curable flat bed printer allows us to produce photographic quality images on just about anything! The Oce also has the ability to print white both as a spot color, and as an underlay for other colors. That means we can print on clear substrates such as acrylic and still have vibrant color. Speaking of color, it uses VariaDot technology, allowing the printer to produce ink dots in various sizes to ensure sharper, more accurate printing. The ink droplets vary from 6 to 42 picoliters. (A picoliter is a trillionth — one millionth of a millionth, or 10 to the -12th power. That’s represented as 0.000000000001/liter). The 6 picoliter drops allow us to produce high resolution images, while the 42 picoliter drops allow for dense, uniform solid colors – all while saving ink! 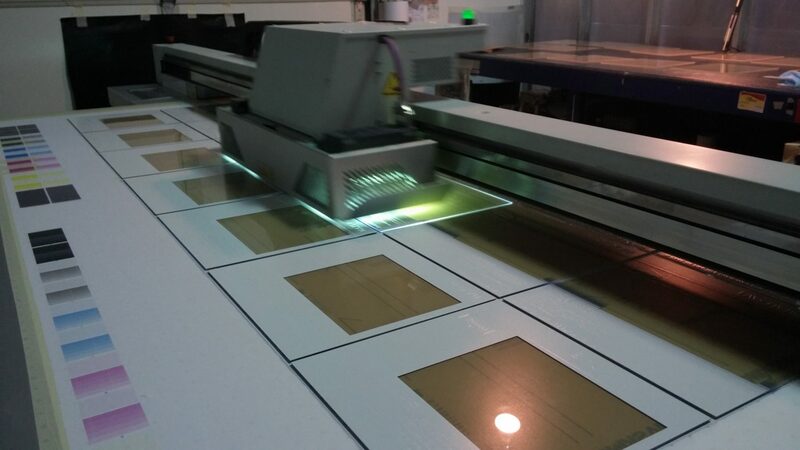 Our Oce prints 239 square feet per hour on rigid materials – that’s 1,912 square feet per day! We can print up to almost 60 4ft by 8ft boards in a full day. There is no minimum print size, so we don’t have to waste large boards for small jobs. It can also print on irregularly shaped or non-square items, heavy substrates like glass, or materials with an uneven surface such as wood. We really put our Oce through a serious workout every single day. This entry was posted in Production and tagged oce, printing, production, signs.